Our Ex-Board is able to provide up to 4 PWM outputs channels for proportional solenoid control with proportional current and with a digital pulse width modulated (PWM) signal which can vary from 50 to 10kHz (5-95%). It can accept power supply voltages from 9 to 18 VDC or 12 to 24VDC. 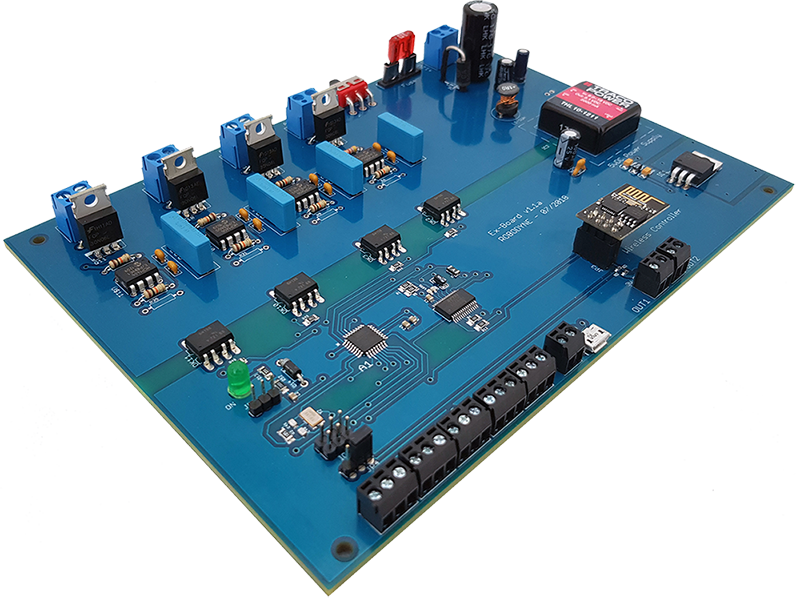 The Ex-board driver utilizes high frequency switching output (PWM) to provide a DC current output of 2 Amps (the maximum current can be configured by the user). A current sensing circuit maintains output current regardless of changes in input voltage and coil resistance. The user can adjust the zero setting, maximum output current, frequency to suit their application. A system of LED’s indicates output power level, input level and power on/off. The unit is available as a stand alone PCB Board or as a Packaged Driver enclosed in an IP67 rated metal housing. The box and DIN rail versions comply with CE directives for EMC. The Board can be easily programmed and configured by using C/C++ language or Arduino IDE or it can be delivered already programmed and ready-to-use. The board also accept RC inputs up to 8 channel so you can use your RC remote transmitter to control each valve. You can remotely control up to 4 Proportional Solenoid Valves, read the solenoids status and check the current system parameters! 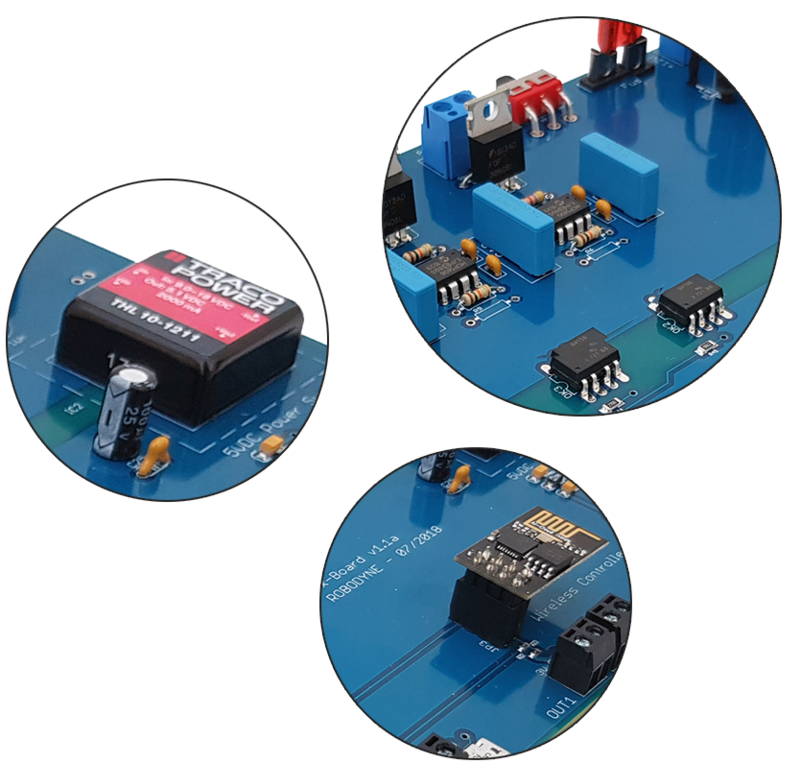 You can also use the board outputs to switch ON/OFF other devices like DC motors or Digital Servos, inductive or resistive loads. The board can use XBee or XBee PRO radio modules if you need to implement mesh networking. Ex-Board provides 5 input ports to read data from sensors or from RC receivers for remote applications in order to let you control all the board behavior and the solenoids by using a RC Transmitter; the standard version of ExBoard includes a Wi-Fi communication board based on the powerful ESP8266-01 module! Do you need extra outputs or inputs channels? Do not worry! just use more than one Ex-Board and stack them on top of each other! Contact us if you need specific customization.